Skyway’s “Software Defined Network” (SDN) service gives you a direct interconnection to over 170 Data Centres (in over 20 countries), perfect for those running any applications in a Private Cloud, or moving Back-up and Disaster Recovery off-site. Our SDN service is through a partnership with Console Connect, which is connected to our network at our Vancouver PoP. The main advantage we offer is the choice of a Private Direct Interconnection to any number of Data Centres, so with one connection to Skyway West and Console you can have multiple Private Connections to a diverse set of Data Centres. 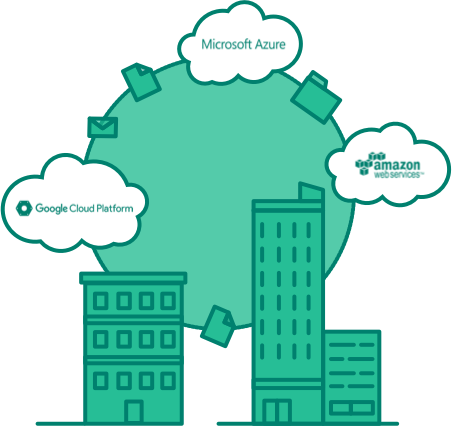 This gives you the ability, for example, to configure an all-Canadian Private route to either Microsoft Azure or Amazon Web Services, and also have additional direct private connections to other services like Google Cloud, Zendesk or Salesforce.com. With Skyway’s Console service you can also make changes on the fly, moving your direct interconnection from one Data Centre or region to another (through a secure web portal), as your business adapts to changing market and performance demands. Although a Canadian route may be important, some applications might need lower latency, and a change from a Montreal location to a Data Centre that is closer to your users can be easily changed. Unlike the competition, you are not required to pay for an expensive second (dedicated) Fibre connection. Instead we can deliver our SDN WAN service over your existing Internet connection. Skyway engineers can also help with complicated BGP configurations, helping to connect your various locations to your own Private Cloud. For Security and Network Performance, we recommend bypassing the open Internet and choosing a direct interconnection to the Cloud through a Private and Direct “Software Defined Network” service.